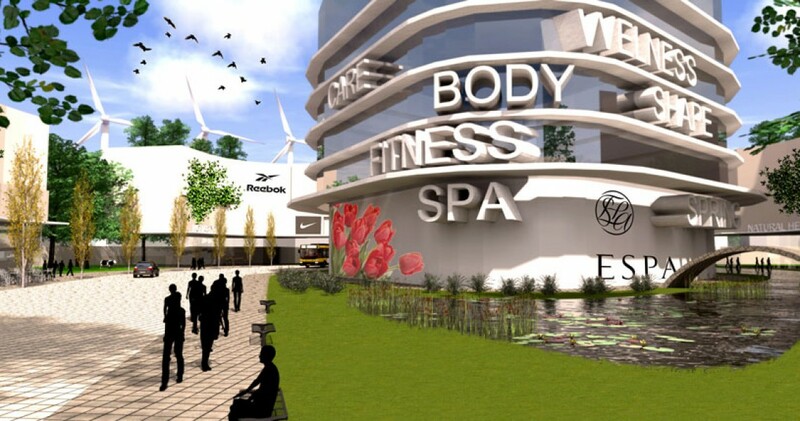 A campus for quality, healthy living. 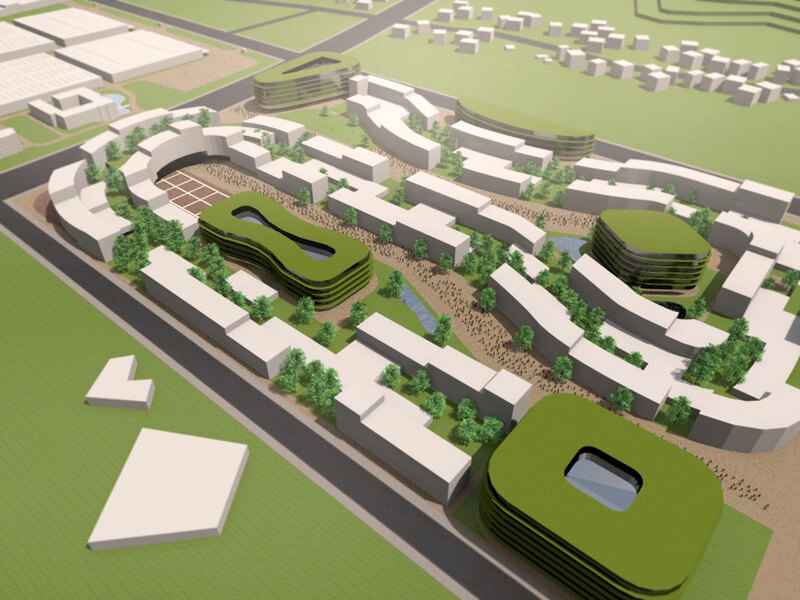 The Chinese milk and grain producer Huierkang approached us for the design of a research campus masterplan in Tong’an, China. Our concept focused on the accessibility of fresh, high quality foods combined with the facilities needed to maintain a healthy lifestyle. The total plot measures 110,000 m2. 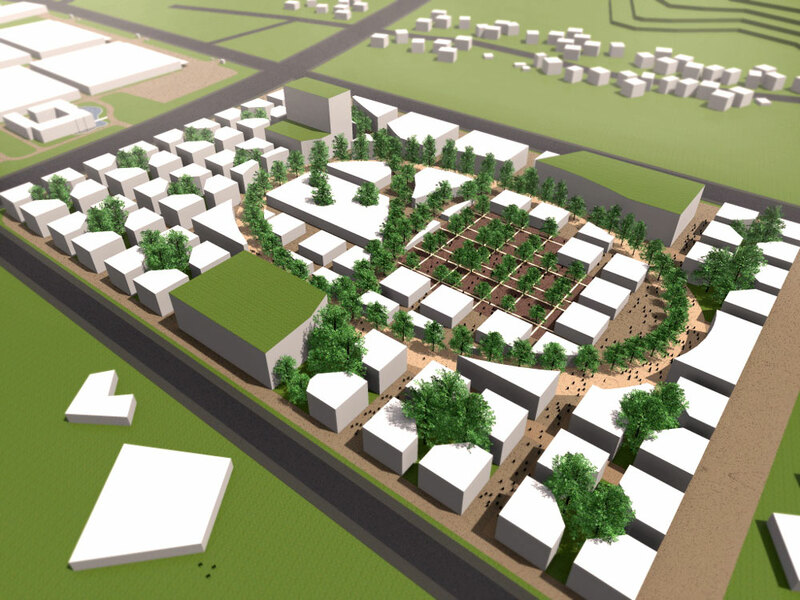 Fifty percent of the plan consists of Chinese SoHos which are the traditional combination of homes and shops. The remaining percentage is divide evenly between offices, retail, leisure, health and entertainment. 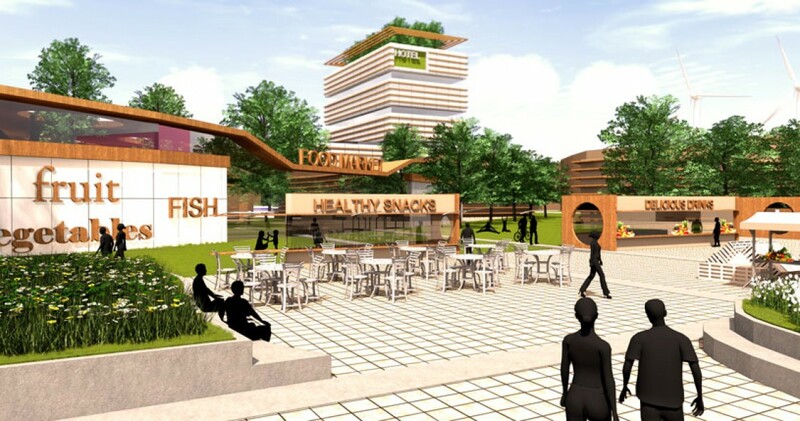 The campus will become a place where people can learn about honest, healthy food choices and purchase products related to general well-being. The organization of the plan can be seen as a network of exchanges. 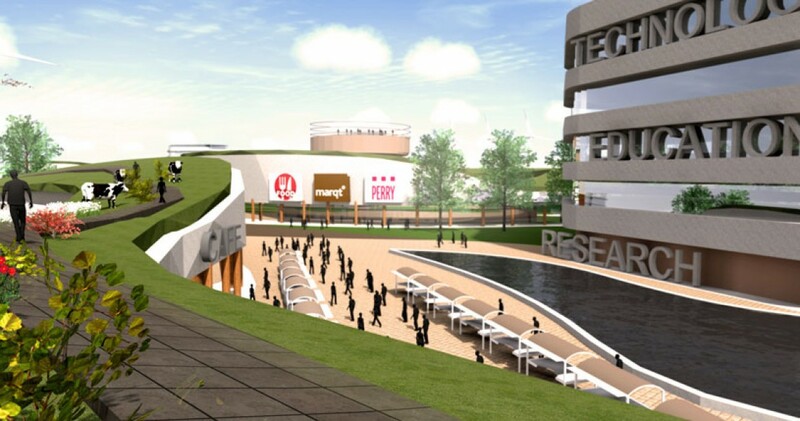 It is an environment where living, working, leisure and research can develop simultaneously. By keeping the building heights less than six storeys we can promote high density areas which feel comfortable and lively most times of the day, stimulate interaction, and entice companies from different industries to invest in the Food Campus. Our design avoids the common practice of building a tall volume surrounded by under-appreciated open space. We saw it fundamental to maintain the human scale in such a large development. Therefore we strengthened the connection between the buildings and the public spaces. This meant giving special attention to greenery and multifunctional public spaces. 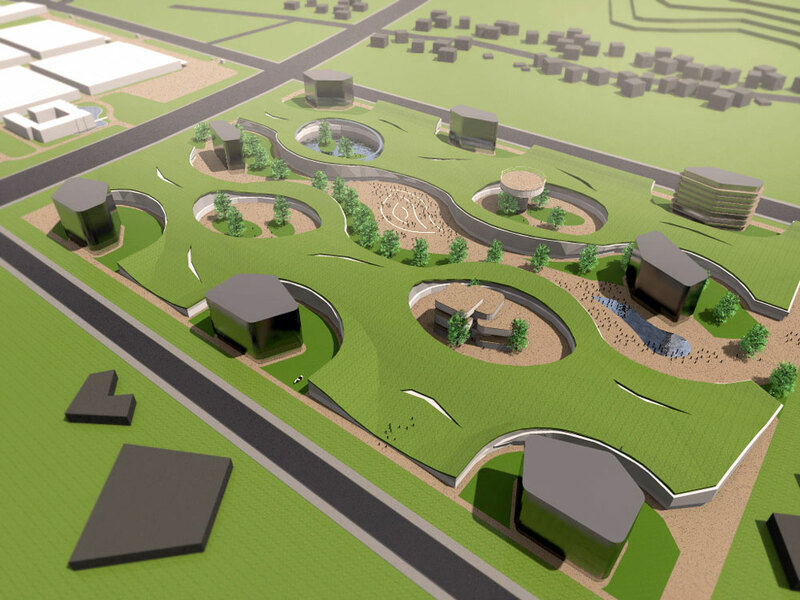 For example, the second model has a track that divides the village center from the ‘suburbs’ which also serves as a green park and exercise path. Another driving force has been our philosophy that Building becomes Landscape, and Landscape becomes Building. This can be seen in the third model where we elevated the landscape and gently tucked the building’s mass underneath. We designed a balanced plan that can be easily phased in construction, responds to its surroundings, and adapts to future change. In order to guide our client through future development strategies we devised three distinct models, each with their own identity. These models incorporated inherent concepts of patterns found in nature. Model 1: Ripples through a pond. In this iteration the large functions such as the hotel or market places represent large stones thrown into a body of water. The SoHos are then developed concentrically around these nodes. Inbetween these lay an attractive, quiet park ripple for the inhabitants. There is a clear route meandering through the plan designed for visitors and circulation. 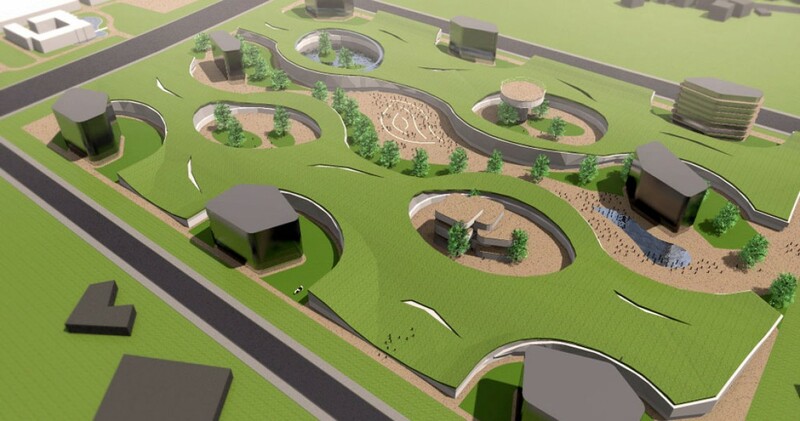 One of its main features is the integration of green public spaces and adaptability. Model 2: Diversity in a cellular grid. Like an organism the center of this model has a lively nucleus where all the functions are concentrated. The perimeter of the nucleus is lined with an exercise track and green park. On the outside of these is an opened grid pattern that houses the SoHos. The plan feels like a small village were people can live in peace while being a short distance from an attractive lively core. The nucleus will utilize low building heights to enhance the human scale and approachability of the spaces. Model 3: Growth in yeast patterns. The final iteration is the most extravagant of the set. The landscape becomes a green roof for the buildings as its elevation climbs and falls over the plot. Functions appear in large craters removed from the roof plain, with a large valley bisecting the plan. 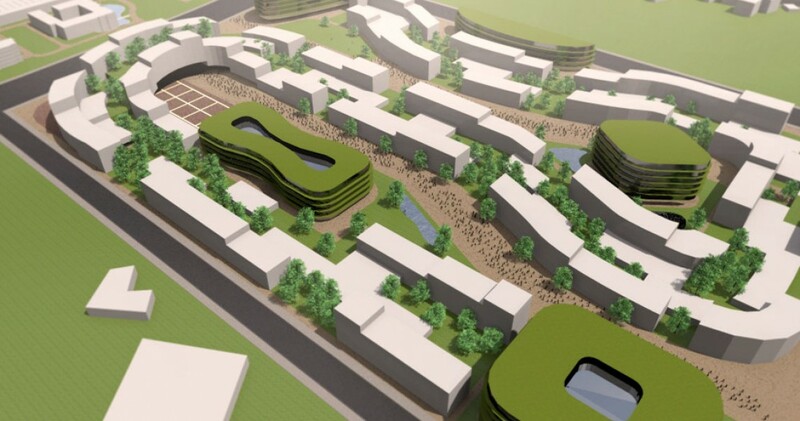 The valley will host activities and public spaces, while the SoHos rest underneath of the green roofs. Peace, recreation, and tranquility can be found on the raised landscape and commercial and living needs can be found below. 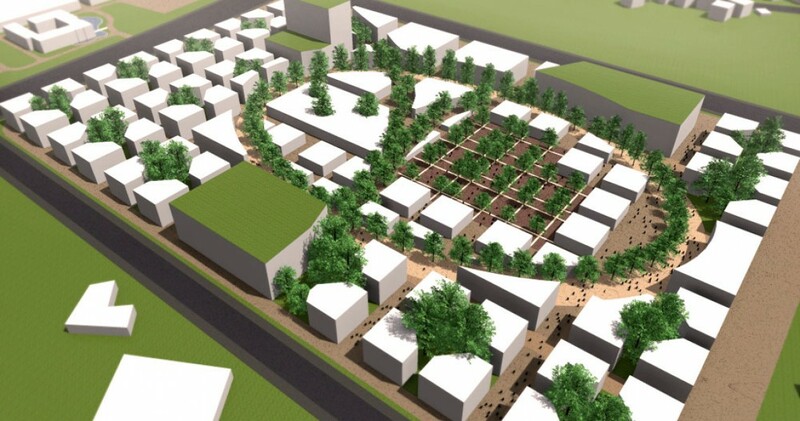 This plan is very recognizable and could become a landmark for Huierkang and Tong’an. Our client chose the second model due to their philosophy on selling and marketing quality, fresh food as well as promoting a healthy life style. The feeling of living in a village with a strong core of activity fit very well with their projected business model. AULa will gladly continue our collaboration with Huierkang.